Saturday I came home from town and as I pulled into the driveway I heard my two dogs barking their heads off. They were really going at it. And when I got out of the Blazer I discovered why…..they had an unwelcome visitor…..another dog! 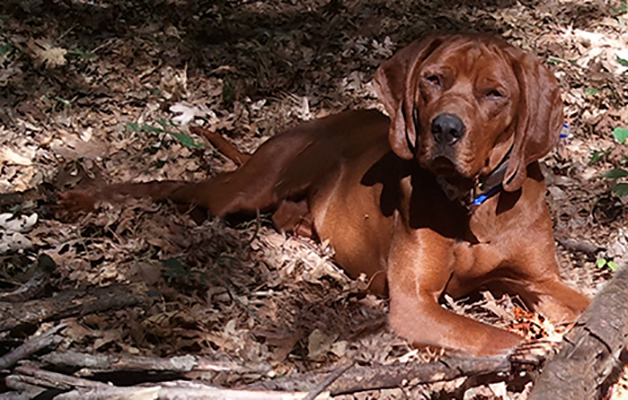 Not just another dog…but a young Redbone Coonhound who was running around outside their pen wanting to play. Duke, the 100 pound Black Lab mix would have probably assented to his wish, but Buster, the Cheagle, wanted no part of him. When I walked up, the dog came running to me thinking I was the answer to playtime. He bounced all around me, wanted to lick my hands, overjoyed that a human was there. He was wearing two collars. One was an old wide leather collar with a tag that had a name and phone number, the other (which I found out later) a training collar. Somehow I managed to get a leash on this beast and took him for a walk around the neighborhood to see if anyone recognized or was looking for this monster. No luck. Had he been dropped off somewhere in the area? I called the number on the collar and found myself talking with someone about 100 miles away who told me that first, it wasn’t his dog, and secondly, he had only had the number for a short while. He asked me the name on the collar and when I told him said he knew someone with that last name and would call her and get back to me. To make a long story short, the dog spent the first night out in the pen. Sunday afternoon after not hearing anything I called the person I’d talked to and found out the name on the collar was a second cousin to the woman he called. However when she called the phone number had been disconnected. Sunday night was spent in the garage as he wouldn’t stop barking in the pen. I spent most of the day trying to figure out what I could do with him. He as too much dog for a 77-year-old geezer to handle, plus having two dogs there was no way I could have another one, even though we live in the woods. So Monday morning I called the county Animal Control Officer, about 40 miles away. Turned out it was the best thing I could have done. 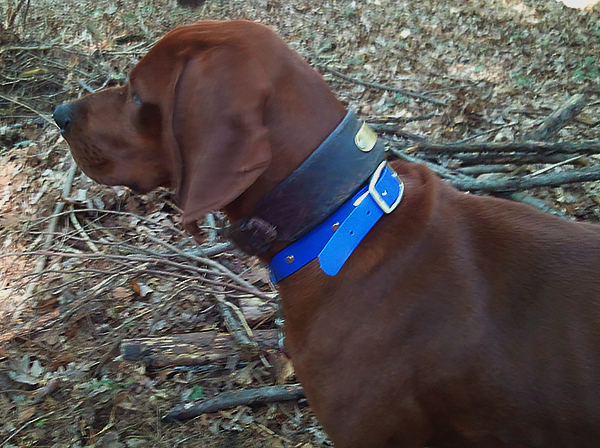 The man that came was friendly, took one look at the dog and his training collar and told me he had picked up another Redbone Coonhound a few weeks ago with the same identical collar. In that case the owner was not found, however the dog was adopted in about a week. He assured me the police would be contacted to see if they could locate the owner and if not, since he was a hunting dog, would probably be adopted quickly. He also told me that a dog that runs away during training might travel a long distance. He really put my mind at ease. So, Friendly Big Hound Dog, I enjoyed our time together. I pray that you will either get reunited with your human or find a new forever home and have a long happy life. You sure deserve it. PS: A few days after I posted I talked to the Animal Control Officer that picked up the dog and found that on the backside of the collar they found the current phone number of the owner and he was reunited with his pup.